Former Virginia Governor Bob McDonnell has filed for divorce from his wife Maureen. That actually happened in November but is just being reported now by WTOP radio in Washington. 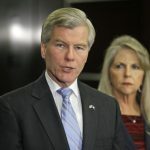 McDonnell was seen as a rising star in the Republican party before being convicted of public corruption in 2014 for taking gifts and loans – that conviction was later thrown out by the U.S. Supreme Court.